So, I keep wondering was any of this shown to the HSCA or Dr. William Pepper? In this 1968 photo released Wednesday, March 30, 2011 by the Shelby County Register's office, James Earl Ray is seen in the Shelby County, Memphis, Tenn. Long forgotten photos documenting the incarceration of James Earl Ray after his arrest for the assassination of Martin Luther King Jr. will be posted online as early as Wednesday afternoon to commemorate the 43rd anniversary of the civil rights leader's death. How Stupid Were They? He's Facing the Wall! What the F*ck is the point of this photo? 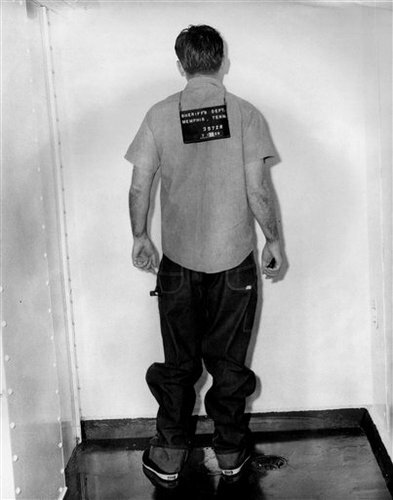 This is James Earl Ray facing the wall, and the identification slate is upside down, as though that's how all the fashionable inmates wear it. Is this supposed to help identify him? Suspect was said to have a featureless flat latex appearance..., hey wait a minute. 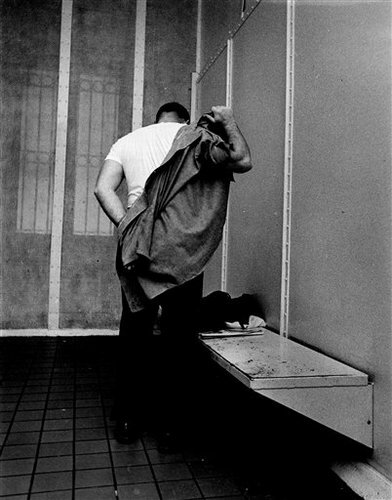 In this 1968 photo released Wednesday, March 30, 2011 by the Shelby County Register's office,James Earl Ray is seen in the Shelby County, Memphis, Tenn., jail. 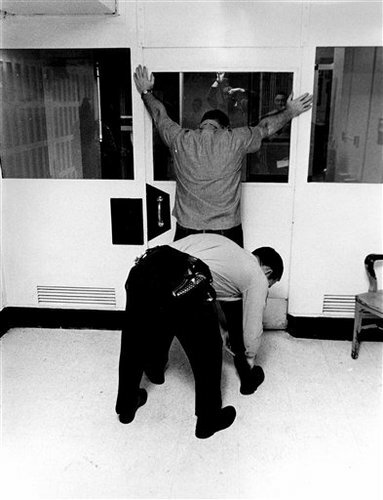 Long forgotten photos documenting the incarceration of James Earl Ray after his arrest for the assassination of Martin Luther King Jr. will be posted online as early as Wednesday afternoon to commemorate the 43rd anniversary of the civil rights leader's death. What else awaits discovery in the city and county buildings of Memphis? (CNN) -- Recently discovered photos and letters are giving an inside look at the man convicted of assassinating the Rev. Martin Luther King Jr.
On April 4, 1968, King was shot and killed by a sniper as he stood on a balcony of the Lorraine Motel in Memphis, Tennessee, where he was trying to mediate a garbage workers' strike. The celebrated civil rights leader's death led to race riots in dozens of cities and mourning around the world. American James Earl Ray pleaded guilty to the murder of the civil rights leader and was sentenced to 99 years in prison in March 1969. Ray died in 1998. Little was known of Ray's state of mind in his months in jail before his guilty plea -- until Shelby County, Tennessee, officials came across a bundle of documents about five years ago in a local archival building. "In 2005, we started going through the Shelby County archives -- going through organizing, identifying things," Tom Leatherwood, Shelby County register of deeds, said Wednesday. "But then in 2006 or 2007, we found this bundle. I said well, what is it? Let's see. And so we picked it up, turned it over, and there it was." That bundle -- an unassuming, mustard-yellow folder with tape crisscrossing it -- had inscribed on it in black marker, "Public Defender James E. Ray. Do Not Destroy." Inside was a wealth of information, including photos of the newly incarcerated accused murderer, as well as letters to family and his attorney during the eight months he was detained at the Shelby County jail. Since then, Leatherwood said, he has been working with the county attorney to try to get those documents released to the public. "There's no game-changer here, but for history lovers, there's some really great information," Leatherwood said. Black and white photos show Ray being patted down by law enforcement; others show him being ushered into his jail cell. One photo shows him being escorted out of a vehicle by then-Sheriff Bill Morris and surrounded by a phalanx of police, apparently on the night he arrived in Memphis after his extradition from England, where he was captured. Letters and Christmas cards exchanged between Ray and his family indicate a close relationship. "Take it easy," was a frequent sign-off from Ray to his brother and sister. Ray asked his sister to visit two months after his capture by police. "Bring enough to stay a couple of days," his note reads. "I can explain everything when I see them." Another letter, sent to Ray's brother Jerry just a month before he pleaded guilty, read: "If you have anything to say about case or anything else don't write it wait until I see you or visit." Ray also made sure whatever financial gains his story might produce for future generations would be passed on to his brother, Jerry. "I hereby leave the property belonging to me at the time of my death, being any rights to book royalties, movie royalties and rights and rights to any other monetary compensation whether literary or otherwise," he wrote by hand in his last will and testament. Also included in the document release are photos of Sirhan Sirhan, the convicted killer of Robert F. Kennedy. The sheriff had contacted law enforcement in California to gain knowledge on how they managed security around Sirhan. "(Morris) knew he had a potentially explosive situation here, so he reached out to them for advice on how to handle a high-risk, high-profile inmate," Leatherwood said. After his sentencing, Ray recanted and asked to be tried on an innocent plea, but was rebuffed by the courts. Forensic tests were conducted in 1997 on a hunting rifle recovered near the scene of the assassination, but the results were inconclusive. After years of fighting to get his name cleared, Ray spent his last days in a coma at a Nashville hospital and died of liver failure in 1998. Monday marks the 43rd anniversary of King's death. Leatherwood said the full release of documents will be made available on the Shelby County Register of Deeds website athttp://register.shelby.tn.us/. What Would Harold Weisberg Think of Hampton Sides? "I eschew the hackneyed but successful devices of fiction...,"